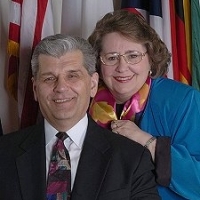 Wes & Carol Mathis are missionaries to the Military and International community at Neighborhood Church in Okinawa, Japan. We have served in this capacity for the last seven and one half years. Previously we served Yokota Christian Center in Tokyo for eight and one half years. We currently also serve as the Asia Pacific Military Ministries Field Representative for the Assemblies of God. Hundreds have been saved at the altars of our churches, in our living room and other places. We try to operate our church as much like you would in America with all of the A/G ministries. We have services on Sunday AM, Wednesday eve. with Adult Bible Study, Missionettes, Royal Rangers, Youth, Nursery,Children Churches and much more. We work closely with the Marine,Air Force, Navy and Army Bases here in Okinawa and throughout Japan and the Asia Pacific Region. Several nationality groups comprise our church and we translate our serivces in Japanese., Updatead News: Special Upadate: So many have been saved. Our church is packed each Sunday and the parking lot is overflowing. Lord. We offer a new ministry to families of deployed soldiers called PALS, Prayer and Loving Support which reaches out to the needs of families while the husband and Dad are away for sometimes over a year. We have recently seen many healed of cancer and other physical needs. The forces of darkness are being broken down. We recently added a full time couple to join us in ministry as associates so we would ask you to pray for them as well. Also we need MAPS construction teams to come and do a lot of renovation work on our three buildings. Much of our time is taken up in counseling and meeting as many needs as possible. Our Sunday morning prayer meetings brings together almist 70 people each Sunday morning at 8:45am. Please pray for all of our military churches around the world. As Asia Pacfic Military Representative we are in need of couples to commit to come and pastor some of our churches. We thank each of you in advance for praying for us, our ministry and ask that God would use us for His Glory as we continue to serve the military and their families, the Japanese and Okinawan community and many internationals from around the world.